CENTIPEDE prefers acidic soils and establishes at a moderate rate. It is light green in color with a coarse leaf texture. It is a low maintenance grass that requires little fertilization, infrequent mowing and has a fair shade tolerance. However, it does not tolerate traffic, excessive thatch, drought, or heavy shade. Centipede has a low salt tolerance; if it is to be used at or near the beach, sites should be chosen carefully. CELEBRATION BERMUDA is a new introduction to the bermuda grass family. Developed in Australia and brought to the US by Sod Solutions, Inc. it is very similar to Tifway but with some slight variations. It is a deep blue-green color. It has an improved shade tolerance and excellent drought tolerance. Because it has a very prostrate growth habit, mowing requirements are reduced by as much as 50%. RALEIGH ST. AUGUSTINE does well in a wide range of soil types and establishes quickly. It is medium green in color with a coarse leaf texture and withstands wear and traffic fairly well. It has the best shade tolerance of the warm season grasses. It has a good salt tolerance and can be used at the beach. St. Augustine is fairly drought tolerant. TIFWAY 419 BERMUDA has been an industry standard for over 40 years. It is the preferred turfgrass for golf course tees, fairways and home lawns. Bermuda does well in a wide range of soil types and establishes quickly. It is dark green in color with a fine leaf texture. Its ability to withstand wear and traffic is excellent and it recovers rapidly from injury. It has a moderate salt tolerance and is good for the beach. Bermuda also has a good drought tolerance. However, it has a poor shade tolerance and requires full sunlight to thrive. It also requires frequent fertilization. Tifway 419 also requires frequent mowing (every 4-5 days). ZOYSIA does well in a wide range of soil types and establishes at a moderate rate. It is dark green in color with a fine-to-medium leaf texture (depending on the variety). It withstands wear and traffic quite well and has a moderate shade tolerance. Zoysia has a high salt tolerance and is excellent for the beach. It also has a good drought tolerance. 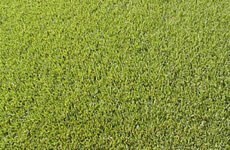 Each variety of Zoysia has slight variations in color, texture, and characteristics. Choice may depend on location and personal preference.